Introduction: The number of foreign travelers arriving in India has shown an exponential increase from 1.2 million in 1981 to 8.03 million in the year 2015, with an annual growth rate of 4.5%. With the influx of internationally mobile students to developing countries such as India comes the responsibility of having to cater to the health needs of these visitors. The current study was undertaken with the objective of assessing how travel prepared the international student travelers were, what gaps existed, and how better to address this issue in the future. Methods: A cross-sectional study was conducted at a medical college in Bengaluru city of South India during the 6-month period from March to August, 2015. International students doing an elective rotation at the medical college were approached to participate in the study. Written informed consent was obtained from participants, and a 23-item, self-administered questionnaire was distributed to them. Data was entered in EpiData software v3.1 and analyzed using Statistical Package for Social Science v 21.0. Results: The current study comprised 43 elective students. The mean age of the participants was 24 ± 2 years with age ranging from 19-29 years. Females made up the majority (79.1%). A majority of the students (69.8%) had purchased travel insurance, 62.8% had consulted a doctor prior to their travel, and 74.4% had carried a first aid kit during their travel. Conclusion: The current study highlights the variability in the uptake of pre-travel health consultation, vaccination, and other precautions taken by student travelers. Determining the most appropriate strategies for increasing pre-travel health preparation is the next step in advancing travel medicine research. Indian Tourism Statistics. Market Research Division. Ministry of Tourism, Government of India; 2015. Status of International students in India for higher education. Government of India and UNESCO; 2014. Travel Preparedness – Prepare for everywhere. CDC. https://www.cdc.gov/phpr/documents/pre-infographictravelprep.pdf. Accessed August 8, 2017. CDC Yellow Book: Health information for International Travel 2018. https://wwwnc.cdc.gov/travel/yellowbook/2018/select-destinations/india. Hawkes S, Hart GJ, Johnson AM, et al. Risk behaviour and HIV prevalence in international travellers. AIDS. 1994;8(2):247-252. doi:10.1097/00002030-199402000-00013. Heywood AE, Watkins RE, Iamsirithaworn S, Nilvarangkul K, MacIntyre CR. A cross-sectional study of pre-travel health-seeking practices among travelers departing Sydney and Bangkok airports. BMC Public Health. 2012;12:321. doi:10.1186/1471-2458-12-321. Laver SM, Wetzels J, Behrens RH. Knowledge of malaria, risk perception, and compliance with prophylaxis and personal and environmental preventive measures in travelers exiting Zimbabwe from Harare and Victoria Falls International airport. J Travel Med. 2001;8(6):298-303. doi:10.2310/7060.2001.23975. Van Herck K, Van Damme P, Castelli F, et al. Knowledge, attitudes and practices in travel-related infectious diseases: the European airport survey. J Travel Med. 2004;11(1):3-8. doi:10.2310/7060.2004.13609. LaRocque RC, Rao SR, Tsibris A, et al. Pre-travel health advice-seeking behavior among US international travelers departing from Boston Logan International Airport. J Travel Med. 2010;17(6):387- 391. doi:10.1111/j.1708-8305.2010.00457.x. Lopez-Velez R, Bayas JM. Spanish travelers to high-risk areas in the tropics: airport survey of travel health knowledge, attitudes, and practices in vaccination and malaria prevention. J Travel Med. 2007;14(5):297-305. doi:10.1111/j.1708-8305.2007.00142.x. Wilder-Smith A, Khairullah NS, Song JH, Chen CY, Torresi J. Travel health knowledge, attitudes and practices among Australasian travelers. J Travel Med. 2004;11(1):9-15. doi:10.2310/7060.2004.13600. Hamer DH, Connor BA. Travel health knowledge, attitudes and practices among United States travelers. J Travel Med. 2004;11(1):23-26. doi:10.2310/7060.2004.13577. Toovey S, Jamieson A, Holloway M. Travelers’ knowledge, attitudes and practices on the prevention of infectious diseases: results from a study at Johannesburg International Airport. J Travel Med. 2004;11(1):16-22. doi:10.2310/7060.2004.13587. Ahlm C, Lundberg S, Fesse K, Wistrom J. Health problems and self-medication among Swedish travellers. Scand J Infect Dis. 1994;26(6):711-717. doi:10.3109/00365549409008640. Fleck S, Jager H, Zeeb H. Travel and health status: a survey follow-up study. Eur J Public Health. 2006;16(1):96-100. doi:10.1093/eurpub/cki144. Redman CA, Maclennan A, Wilson E, Walker E. Diarrhea and respiratory symptoms among travelers to Asia, Africa, and South and Central America from Scotland. J Travel Med. 2006;13(4):203- 211. doi:10.1111/j.1708-8305.2006.00046.x. Rack J, Wichmann O, Kamara B, et al. Risk and spectrum of diseases in travelers to popular tourist destinations. J Travel Med. 2005;12(5):248-253. doi:10.2310/7060.2005.12502. 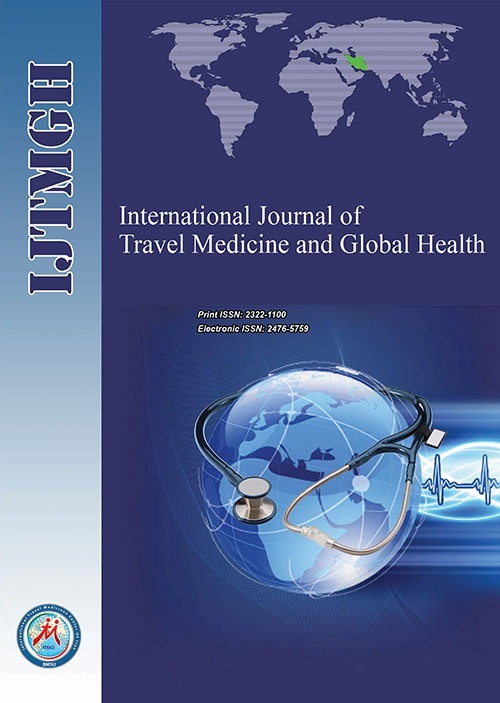 Winer L, Alkan M. Incidence and precipitating factors of morbidity among Israeli travelers abroad. J Travel Med. 2002;9(5):227-232. doi:10.2310/7060.2002.24202. Abdullah AS, McGhee SM, Hedley AJ. Health risks during travel: a population-based study amongst the Hong Kong Chinese. Ann Trop Med Parasitol. 2001;95(1):105-110. doi:10.1080/00034983.2001.11813620. Cossar JH, Reid D, Fallon RJ, et al. A cumulative review of studies on travellers, their experience of illness and the implications of these findings. J Infect. 1990;21(1):27-42. doi:10.1016/0163-4453(90)90600-D.
Cabada MM, Maldonado F, Mozo K, Seas C, Gotuzzo E. Self-reported health problems among travelers visiting Cuzco: a Peruvian Airport survey. Travel Med Infect Dis. 2009;7(1):25-29. doi:10.1016/j.tmaid.2008.09.005. Steffen R, Rickenbach M, Wilhelm U, Helminger A, Schar M. Health problems after travel to developing countries. J Infect Dis. 1987;156(1):84-91. doi:10.1093/infdis/156.1.84. Pizam A, Jeong GH, Reichel A, et al. The Relationship between Risk-Taking, Sensation-Seeking, and the Tourist Behavior of Young Adults: A Cross-Cultural Study. J Travel Res. 2004;42(3):251-260. doi:10.1177/0047287503258837. Heywood AE, Zhang M, MacIntyre CR, Seale H. Travel risk behaviours and uptake of pre-travel health preventions by university students in Australia. BMC Infect Dis. 2012;12:43. doi:10.1186/1471-2334-12-43. Thanassi W, Weiss E. Travel related emergencies: immunizations and travel. Emerg Med Clin North Am.1997;15:43-70. doi:10.1016/S0733-8627(05)70285-6. Scoville SL, Bryan JP, Tribble D, et al. Epidemiology, preventive services, and illnesses of international travelers. Mil Med. 1997;162(3):172-178. doi:10.1093/milmed/162.3.172. Schunk M, Wachinger W, Nothdurft HD. Vaccination status and prophylactic measures of travelers from Germany to subtropical and tropical areas: results of an airport survey. J Travel Med. 2001;8(5):260-262. doi:10.2310/7060.2001.24031. Pavli A, Smeti P, Antoniadou F, Katerelos P, Maltezou HC. Vaccinations of international travellers from Greece to Sub- Saharan Africa. Int J Travel Med Glob Health. 2017;5(2):46-52. doi:10.15171/ijtmgh.2017.10.